When my parents downsized this past fall they let me choose a few pieces of furniture I’d like to have. Even if the style wasn’t quite my jam, I couldn’t pass up the offer. While one benefit of being in my thirties versus my twenties is that I don’t have to decorate with hand-me-down furniture and Ikea finds anymore, I'm still not Mrs. Warbucks or someone who likes wasting money. 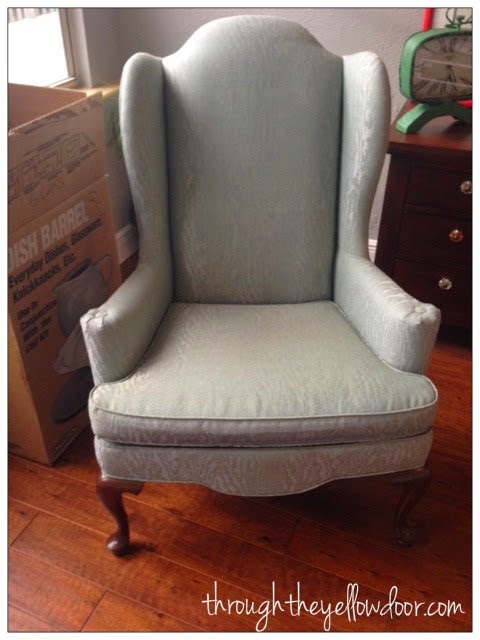 If someone offers me 2 free Ethan Allen wingback chairs - I don’t turn them down! That being said, the frosty-ice and mauve fabric choice the chairs were sporting were definitely not my style. They scream early 1990's to me - what do you think? My original thought was that I would just get them re-upholstered, but WOW - that is super expensive! 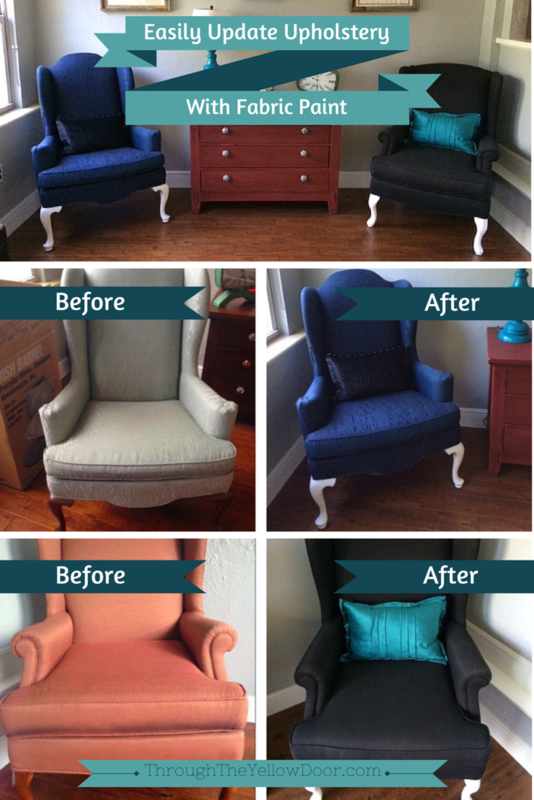 It was going to cost us close to $1,200 to get them both re-upholstered and that is just not something we can justify doing. So, I took to the internet in search of a solution and came across Simply Spray Paint. If their claims were to be believed, I could possibly just spray paint my chairs another color! No way. I had a million questions and some DEFCON LEVEL 1 skepticism. How is this even possible? Will the paint wear off on people that sit on the chairs? Will the fabric become hard and crunchy? I did some “research”, meaning I read some reviews, watched some YouTube videos, read a couple blog post tutorials and I was totally still skeptical (Defcon level 2 now), but completely intrigued. I figured the chairs were just sitting in the garage because I didn’t like the current fabric so what did I have to lose?! 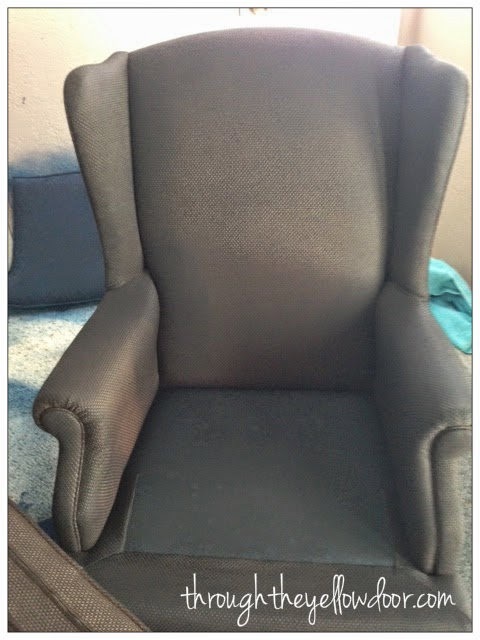 Anyway, how in the world did I go about spray painting wing back chairs? Just like you think I would - I went to town and sprayed my heart out. The chairs each had their own unique fabric type, making the application process different. The mauve chair sucked up the spray paint like a desert plant, I’d use up an entire bottle and it would look like I had barely covered any surface area, it ended up taking me 12 bottles of black Simply Spray Paint to fully cover the fabric. I don't fault the paint for this, the issue was in the fabric (damn you 1990's!!!). The frosty-ice fabric was smoother and the spray would actually run down the chair, which allowed me to rub the paint in with a towel. That particular fabric was a bit easier to work with I was able to get a solid navy blue color in about 8 bottles of Navy Simply Spray Paint. Check out that sweet "zebra/animal type" print action bleeding through the paint! One downfall to the process is that the fabric takes awhile to fully dry. I blame a portion of that on the fact that we live in Florida and it’s never 100% dry here, even indoors. 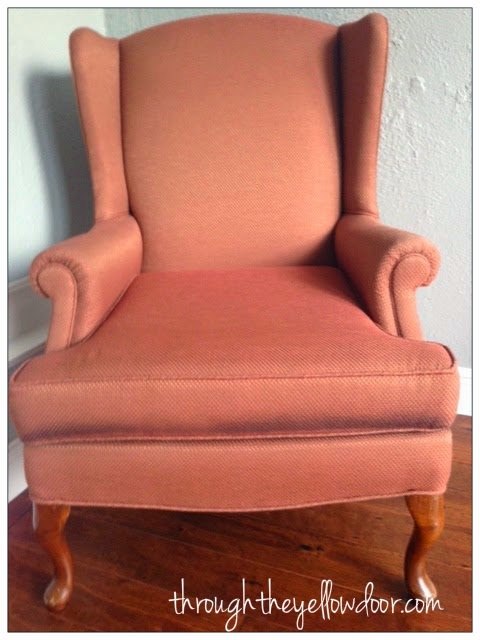 The other issue was that extremely absorbent fabric of the (originally) mauve chair! Seriously, that fabric was a basically a giant woven sponge. 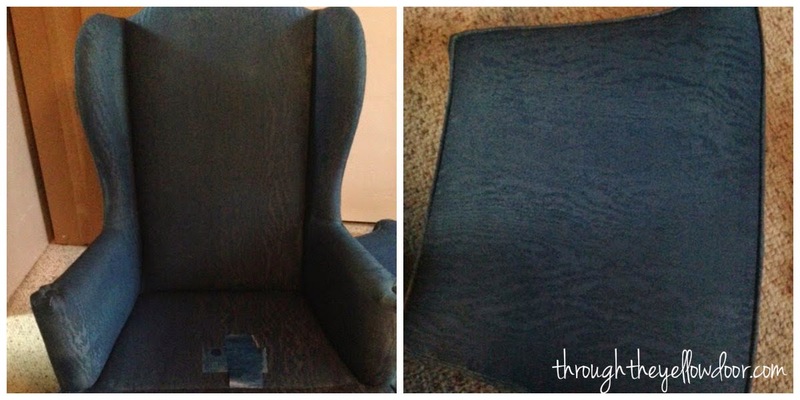 I had to use so many coats of paint that it took over a week (9 days to be exact) for that chair to fully dry! However, the navy blue one was dry in about 72 hours. The texture on the black chair (formerly mauve one) is definitely stiff and when you sit on it, there is a slightly crunchy feeling and a bit of a sound. Matt says I'm crazy on the sound part, but I swear I hear it! The blue one (formerly frosty-ice one) is just a tiny bit stiff, but not nearly as bad as the black one. I'm sure the stiffness is a result of the amount of paint I had to apply. Overall, I would say that the paint does change the feel of the fabric slightly. I don’t think these chairs will ever become anyone’s most comfortable chair, but since we’re using them near the 'formal' dining room area they’ll probably never get any real usage anyway. All the action happens near the tv. Duh. 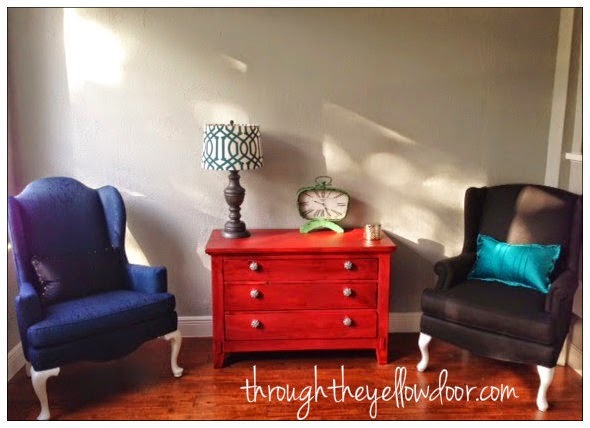 So there you go: up-cycled, DIY chairs for less than the cost of professional re-upholstery!